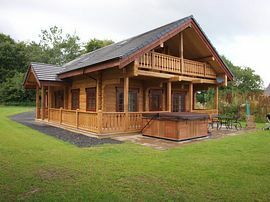 Croeso/Welcome to Dwr Y Felin Log Cabins. 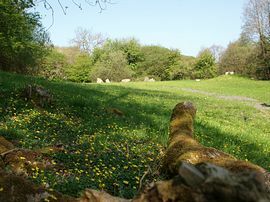 Get away from the hustle and bustle of daily life with your loved ones to this tranquil place, and enjoy the wonders of the Welsh countryside. 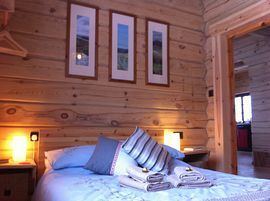 We offer eco friendly accommodation in 3 Log Cabins, providing you with a holiday that will remain as one of your most treasured memories, whether you are a couple looking for Romance, a luxury family holiday, or a long awaited family/friends reunion. This is also an ideal location for that extra special Honeymoon (Luxury Pamper pack available). When you arrive at Dwr Y Felin Log Cabins you will receive a natural Warm Welsh Welcome from Sarah, Hugh and family who will ensure that you have all that you need and that your stay is as pleasurable as can be. Each Log Cabin sleeps 6 guests in three unique bedrooms, one king, one double and one twin. Three shower rooms allow plenty of space for everyone! The fully fitted kitchen with open plan dining area and lounge is a must for all those wanting to enjoy entertaining. The cosy mezzanine upstairs is ideal for watching that film. Handmade Tiffany lampshades hang in all bedrooms, and original artwork on all the walls of local landscapes, created by a local artist friend. 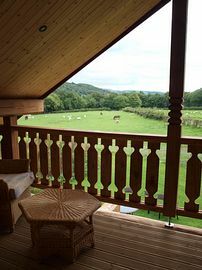 Come and relax, unwind on the balcony with your breakfast surrounded by Welsh countryside and enjoy your barbecue outside on the veranda while the children play on the lawn. Pamper yourself in the steam sauna and hot tub and stroll around the beautiful woodland. Carno is a great base for exploring Mid Wales, especially the beaches, local market towns, castles, mountains and lakes. For the more adventurous there is sailing, fishing, quad biking, clay shooting, or even the Forest Xperience Rally School. All beds have cotton sheets and continental quilts.Beds made up ready for your arrival. Local pub which serves food daily with beer garden. Train station in Caersws - 10 minute drive away from Log Cabin. Local Butcher, delicatessen and Chip shop in Caersws. Train station in Caersws about 5 miles from Carno. Main bus station in Newtown 10 miles from village. Detailed directions to the Log Cabin are sent at time of booking. Friday and Monday are our normal changeover days, although we are very flexible to our guests' requirements. Arrival time to Log Cabin 4.00pm. Departure time from Log Cabin 9.30am. Thank you so much you have created a beautiful 'log haven'. We had a fantastic week and have enjoyed every single moment. The Cabin is gorgeous and we cant wait to come back. It's so hard to find the right words to describe this all!! 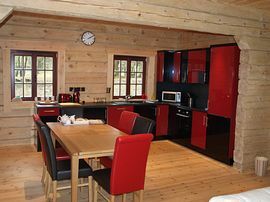 Accommodation is spacious, clean and comfortable with unusual decor and furniture which adds to the holiday experience. Will be back in a few weeks for my birthday! Thank you very much! Best wishes for a busy 2010. Thank you for a brilliant weekend. Your cabin is truly wonderful. We had a very relaxing week end, the perfect escape from daily life. We are sad to leave and looking forward to coming back again soon.